Coming from a native mobile development background, form validation has definitely been a pet peeve of mine. It’s not that validating forms is hard, but the thing is that it usually results in awkward looking code. Getting references to fields, finding out their values, validating them and manually displaying and hiding errors becomes cumbersome really fast. 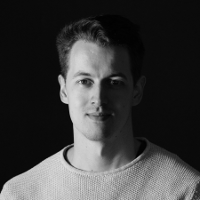 With Flutter, form validation is much more enjoyable to work with. Let’s take a look why. See the sample app here. To put things on perspective, let’s look at a typical form validation setup in a native Android development context. This is the method you’ll most likely stumble upon in most Android codebases. To start, first we have to define the XML layout. This is your standard Android XML layout for a simple login UI. It uses the TextInputLayout and TextInputEditText from the design support library for displaying error labels below the text fields on error cases. 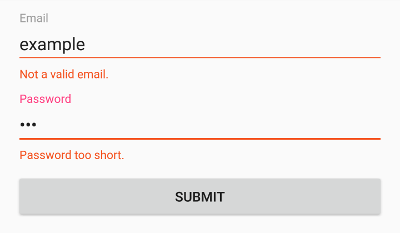 emailInputLayout.error = "Not a valid email." passwordInputLayout.error = "Password too short." val message = "Logging in with $email and $password"
First, we attach an OnClickListener to the submit button. The listener first checks if the email is valid according to our rules. In our case, simply “@” character being present is enough. Then we make sure that the password is long enough, which in our case is a minimum of 6 characters. If all is well, the validate() method returns true and performLogin() gets called. Otherwise we display errors below the faulty text fields and prevent sending the form. The UI markup for the Android sample above took 45 lines of code. The Kotlin part is 50 lines long, which makes the Android sample take a total of 95 lines of code. Let’s look at what it takes to implement the same result in Flutter. There’s two interesting things here: the validator and onSaved parameters. a validator is a method that receives the current value of the field when FormFieldState#validate is called. It should return either an error string or null, depending on whether the field is valid or not. similarly, the onSaved parameter receives the current value of the field when FormFieldState#save is called. This value should be saved somewhere, usually in an instance field of our state, like in the example above. You might notice that we passed a key to our Form widget. Keys could probably be a topic on their own, but to put it simply, think of them as unique identifiers that we can use to get a reference to our widgets. // Form is saved, perform the login now. Calling FormState#validate() loops through every FormField widget contained in our Form, and calls the validator methods on each of them. If there’s any errors, they’re displayed accordingly in the UI. Similarly, calling FormState#save() also loops through every FormField widget inside the Form, but calls the onSaved methods instead. After calling it, we can use the fields for our API calls and what not. // and are saved to _email and _password fields. // This is just a demo, so no actual login here. The Flutter equivalent is 69 lines of code. And contrary to the Android example, it works on iOS too. So, in addition to reducing LOC with 26 lines, our app is also cross-platform. How about that! If you missed it, the source code for a sample app is here.